An RF filter is an electrical circuit configuration (network) designed to have specific characteristics with respect to the transmission or attenuation of various frequencies that may be applied to it. A high-pass filter similarly has a cut-off frequency, above which there is little or no loss in transmission, but below which there is considerable attenuation. Its behavior is the opposite of that of the low-pass filter. A low-pass filter is one that will permit all frequencies below a specified one called the cut-off frequency to be transmitted with little or no loss, but that will attenuate all frequencies above the cut-off frequency. High-pass and low-pass filters can be difficult to construct properly. Whenever possible, many amateurs simply buy them. 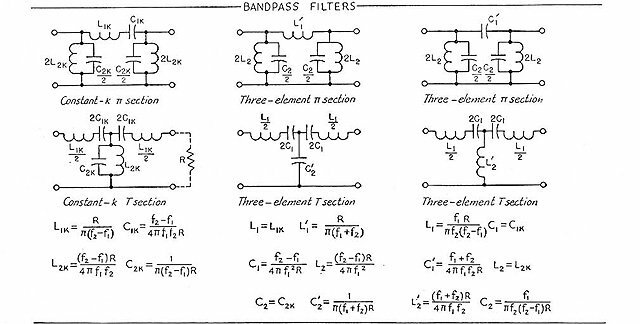 A band-pass filter is one that will transmit a selected band of frequencies with substantially no loss, but that will attenuate all frequencies either higher or lower than the desired band. Sometimes we need a little more output filtering than traditional designs offer. This filter can give you that extra boost. Narrow Band-Pass Filters for HF QEX Sept/Oct 2000, pp. 13-17 The ability to attenuate frequencies above and below a particular band can be very useful to both the contester and the casual operator. Dunestar Model 600 Multiband Bandpass Filter QST March 1995, pp. 85-86 Product Review of an in-line filter that operates on both transmit and receive. Its primary application is reducing interference between HF stations operating in close proximity. A Diode-Switched Band-Pass Filter QST January 1991, pp. 24-26 How to use high-speed silicon diodes as RF switches for selecting two or more filters. Designing Narrow Band-Pass Filters With A BASIC Program by William Sabin W0IYH. May 1983 QST pp. 23-29. Basic filter program written by William Sabin that can be run on old computers, once renamed to nrbnpas.bas. http://www.tonnesoftware.com/ has a collection of filter design programs. Free student versions are available for download.